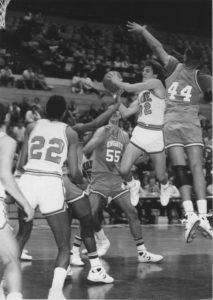 Dean Smith is a Foxcroft Academy graduate who went on to play at the University of Maine where he was a three -time Academic All-American player. Dean captained the Black Bears his senior season and led the America East in scoring. He received the prestigious Walter Byers Award as the nations top scholar athlete. The University of Maine has established the Dean Smith Award given annually to the top male and female athlete who combines academic and athletic excellence.